The Age Discrimination is an equal opportunity law poster by the Louisiana Office Of Human Resources. This is a mandatory posting for all employers in Louisiana, and businesses who fail to comply may be subject to fines or sanctions. This poster must be posted in a conspicuous place where all employees will see it. This poster describes what age discrimination is and how employees can report age discrimination. It appears you don't have a PDF plugin for this browser. 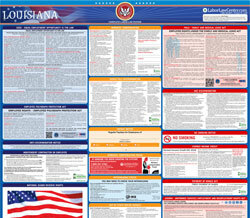 Please see the link below to download louisiana-age-discrimination-ltr-color.pdf. are at least forty years of age. employment because of the individual’s age. employee because of the individual’s age. 3. Reduce the wage rate of any employee in order to comply with  the requirements herein. employment any individual on the basis of the individual’s age. 1. Exclude or expel from its membership, or otherwise to  discriminate against any individual because of his age. to the listed herein provisions. speci ﬁ cation, or discrimination based on age. 3. Discharge or otherwise discipline an individual for good cause.